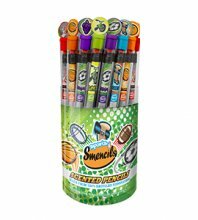 Sports Smencils Smencils  - $275.00 : FiveStarFundRaising!, Five Star Fundraising, Fundraising and fundaisers for all youth groups, elementary schools, and all non profit groups. Sports Smencils are scented pencils that are made from 100% recycled newspapers. Each Sports Smencil is a No.2 graphite pencil and is packaged in its own recyclable plastic freshness tube that includes a collectible character top cap!